Myopia: Intacs® Corneal Implants are indicated for the reduction or correction of mild to moderate myopia (from -0.50 D to -5.00 D) in patients over 21 years, and astigmatism with diopters less than or equal to +1 D.
Keratoconus: Intacs® Corneal Implants are indicated for the treatment of keratoconus, to fully or partially correct myopia or astigmatism in patients that need to restore their visual function and for whom a satisfactory correction of vision with contact lenses or with glasses is not possible, and for patients who wish to avoid a possible corneal transplant. 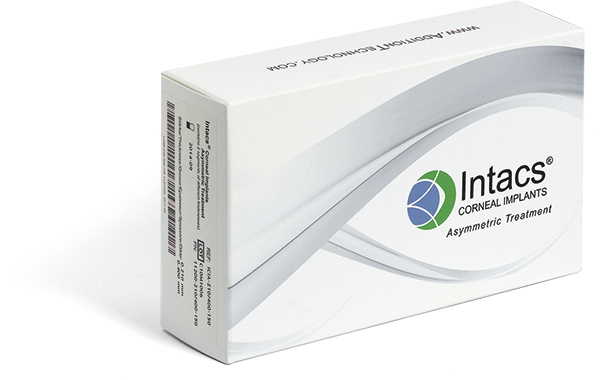 Product description Intacs® intracorneal implants are rounded segments designed to implant in the corneal stromal with a small radial incision, in order to reduce halos and other undesired visual effects. Supply Sterile, single or double units, depending on the reference requested (see table) 2 units per box.